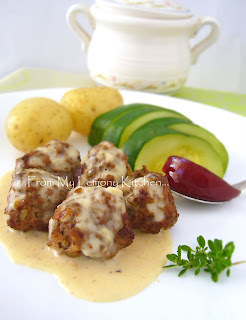 so here it is... Swedish meatballs... minus the cute Swedish flag!!! Saute chopped onion until slightly brownish. Leave it to cool. Then mix all the ingredients and refrigerate for at least 1 hour. Roll into a ball. Heat 2 tablespoon of oil in a frying pan. 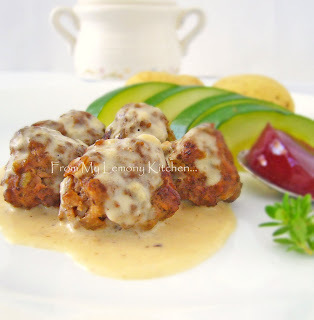 Pan fry the meatballs until brown. Using the same frying pan, melt the butter. Then stir in the flour and pour in the stock. Stir to avoid lumpiness... (may have to strain to have a smooth consistency). Cook on low fire until slightly thickened. Serve the meatballs with steam potatoes, steam vegetables and cranberry sauce. It's very popular when winter is here in Germany. They taste good with the creamy sauce and pasta. I just had these at Ikea 2 weeks ago :) ...now there is a recipe to make them at home. Thanks. Yum yum...these look good...will go well with the carnivore in this house! When it comes to meatballs... I have to make more for my 2 little carnivores..